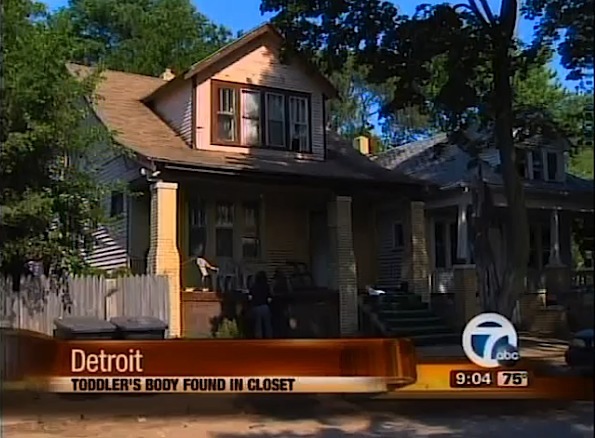 A 17-month old female toddler was found dead under a pile of clothes in a closet (WXYZ-TV Detroit Published July 1, 2012). Ziya Turner, 17-months-old, was missing since Friday June 29, 2012 about 3:30 p.m. from her grandmother’s home in the 18000 block of Brinker Avenue in northeast Detroit. She was found dead Saturday morning June 30, 2012 under a pile of clothing and a metal box and other items in the grandmother’s house on Brinker Avenue. Police are investigating whether the death was an accident or whether foul play was involved. 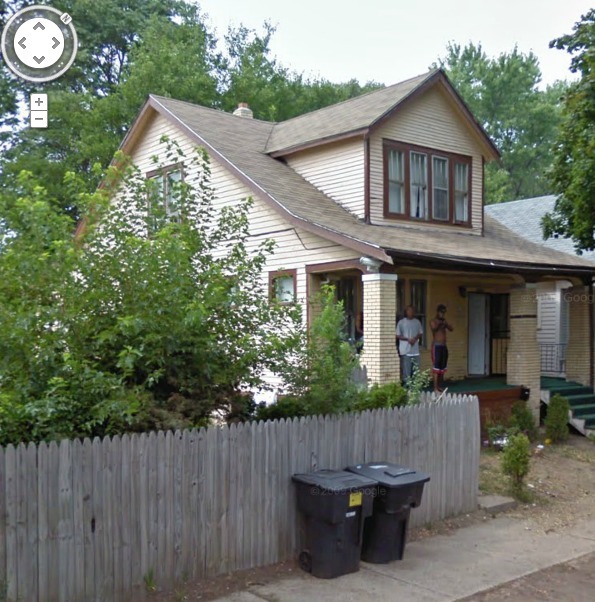 Coincidentally, the house is in the news because it is apparently the same house located where someone using Google Street View spotted what appears to be a group of teens on a porch at the house — with one of the teens aiming a shotgun or what appears to be a long gun at the Google Street View car after it passes the house. Screen shot from ABC7 ACTION NEWS wxyz.com Detroit video showing house where toddler was discovered. 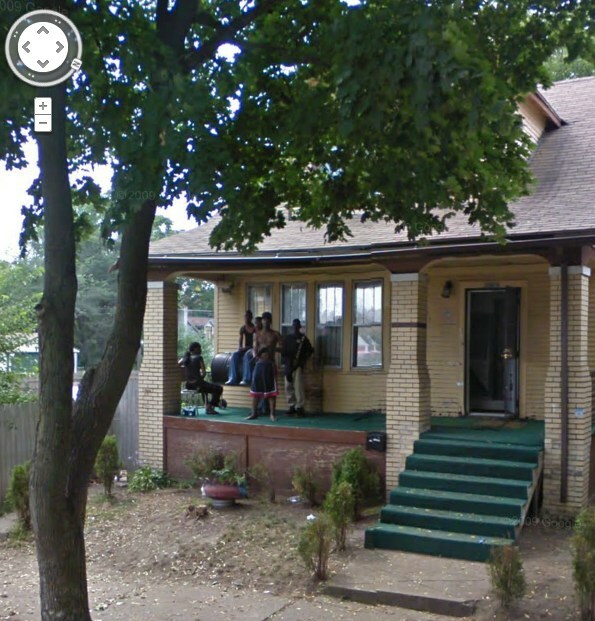 Google Street View camera vehicle passing house at 18000 block of Brinker Avenue in Detroit. Closer view of male/black subject appearing to hold a long gun, just above waist level on the left side of his body in the 18000 block of Brinker Avenue. 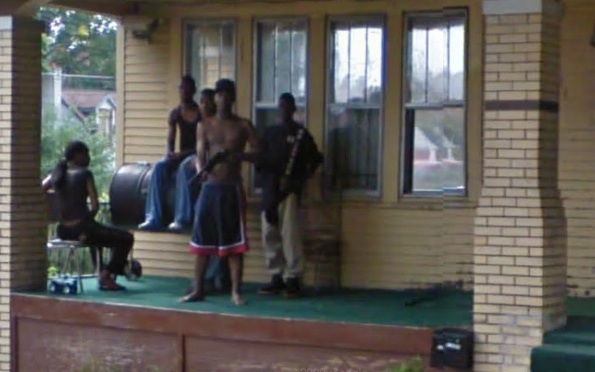 Subject pointing gun at Google Street View camera vehicle after passing the house in the 18000 block of Brinker Avenue, Detroit, Michigan.